Does Sikhi insist on faith? Sikhi insists on this kind of basic faith. Just as you cannot learn to swim unless you get into water, in the same way you can never know spirituality unless you believe in God. Sikhi enjoins faith in the Fatherhood of God and brotherhood of man. 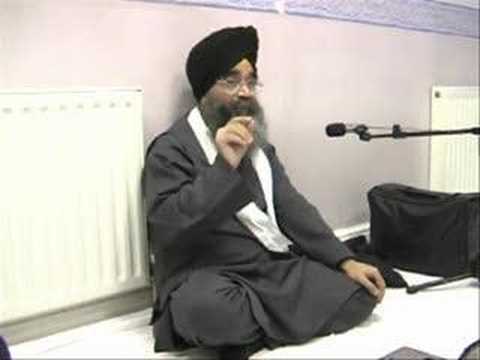 Sikhi emphasizes the need of the True Perfect Guru for spiritual training. Fortunately, the Guru Granth Sahib Ji and the Guru Khalsa Panth are with us for such guidance. Many seek the solution of their spiritual and temporal problems in Guru Granth Granth Sahib ji and seek light from Gurbani. We thus repose our faith in the Guru, discover the great truths enshrined in his message as our wisdom, acting in the light of Gurbani, tells us. Sikhi enjoins us to love God. We cannot love God if we love ourselves. Ego is at the root of all evil and our sufferings. If we concentrate our minds on God and sing His praises, we subordinate and even drive ego out of our minds we can then acquire those great qualities and virtues, which we associate with God. Sikhi believes in universal goodness. The Sikh seeks the God’s Grace, not only for himself but also for the whole world for he believes in the good of all mankind (Sarbat da bhala). This sense of fellowship makes him feel at home everywhere and to look on all as friends. He thus acquires an optimistic outlook on life. Atomic energy and nuclear power have further strengthened the scientists’ belief in the unlimited powers of Nature and Providence. « What is the role of Reason in Sikhi?